Every traveller can name some places they dream about since their childhood. And European children like us, of course, dream about faraway places in America and Australia. For Csaba it was Florida, Hawaii, Sydney and New York. For me it was the Great Barrier Reef, Chile, Yellowstone, Yosemite and Glacier National Parks. I was about 10 when we first had internet at home and I remember downloading pictures of pretty landscapes from all over the world and setting them as my randomly changing background image. Since we had a monthly data traffic limit (yes, it was a thing back then, gosh, am I really sooo old?) I could download just a few each month. As a I child I didn’t even recognize where most of those pictures were taken and I didn’t dare dreaming of seeing them in real ever. A couple of years later I knew a lot of these famous national parks by name and I had a huge collection of pictures about them. Still I only believed that my dream of visiting them can become true when I was already there. (Now jumping like 10 years in the narrative…) There on the top of Glacier Point with a view of all the huge waterfalls of Yosemite Valley. There on the boardwalk around Grand Prismatic Spring, the largest rainbow colored hot spring of Yellowstone. There on the shore of Cracker Lake that looked almost unreal with its perfect aquamarine color far away from cities and crowds in a national park called Glacier. 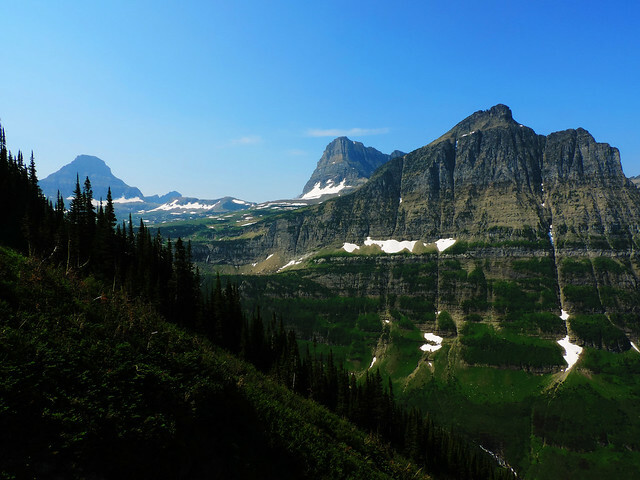 I didn’t know the name of Glacier National Park as a child. Neither I knew that it’s located in Montana at the US-Canadian border. But I knew those landscapes from all the pictures I’ve seen. And once we moved to California for a year I knew I couldn’t leave the US without seeing them in real. 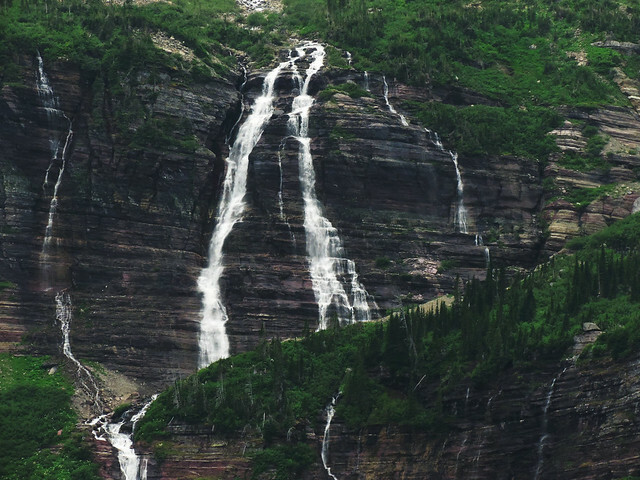 So Glacier National Park ended up to be one of the significant stops on our 3 weeks long road trip through the well-known and not so well-known national parks of the United States. 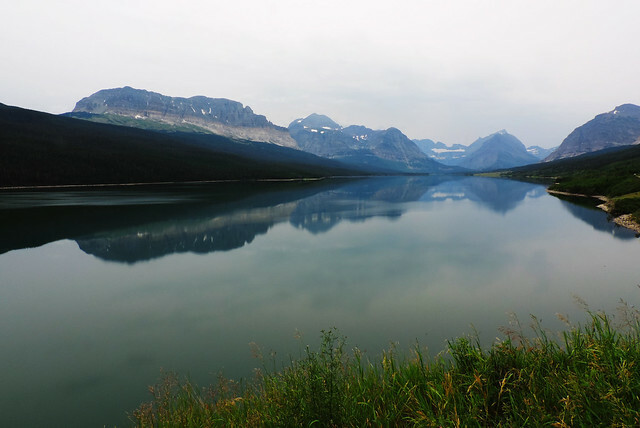 We spent four days in Glacier in July. Four perfectly sunny, beautiful summer days. My expectations were high but reality exceeded dreams this time. 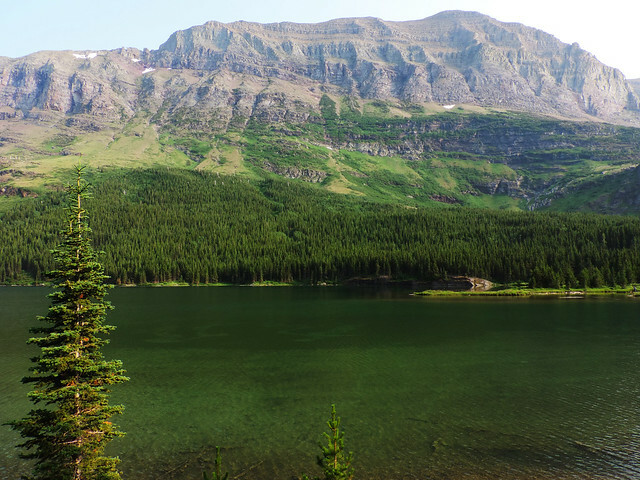 Glacier National Park instantly took our breath away with its stunning views, snowcapped peaks, pretty lakes and exciting wildlife. We saw bighorn sheep, mountain goats and curious marmots wherever we hiked. July looked like spring: millions of wildflowers covered the alpine meadows and oh my, baby animals were the cutest! We could watch a mountain goat teaching his baby how to climb the icy cliffs. Montana maybe sleeps under thick blanket of snow for most part of the year but when it comes to life it is a colorful land from fairy tales. Oh, and a land of grizzly bears, too, because they also wake up by summer. What to explore in 4 days? 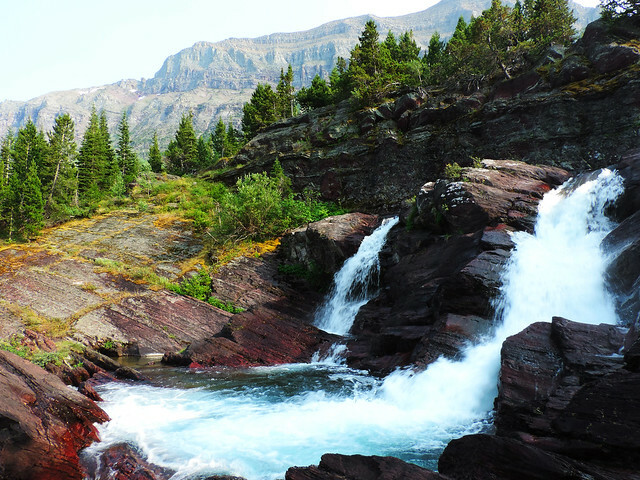 Now it’s time to tell you about our favorite places in Glacier. But since every single thing we saw in this park is our favorite we rather decided to share our 4 days itinerary. And you can take it as a favourite’s list, too. 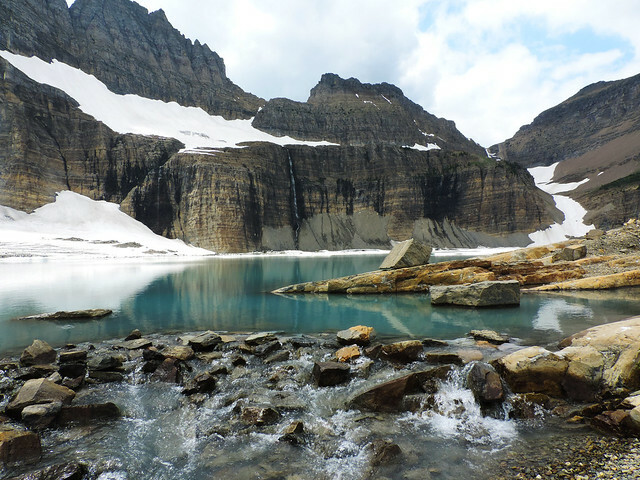 Grinnell Glacier Trail is one of the most popular trails and it was the first day hike we did in the park. Though it’s quite a busy trail but we didn’t mind it. Starting at Swiftcurrent Lake the trail passed two other amazing glacial lakes on the way and it ended at Upper Grinnell Lake, the fourth one that was half frozen even in July. The melting ice flowed into the lake as a waterfall. We could see tons of other waterfalls feeding from snowmelt on the way and there was a spot where we had the most perfect view of all the 3 lakes below us. Summer days are long there. We often stopped to enjoy the views along the way but still we had plenty of time before sunset after getting back to the trailhead. We didn’t want to wait until sunset that is around 11 pm in July but didn’t want to go back to our room yet either. It was a feeling that “Oh my God, we still can’t believe we are here and we want to spend every moment when we are awake exploring this place!”. So we drove along Saint Mary Lake then walked to lovely St Mary Falls. Ooops… Is it 9 pm already? Time to have some rest. Because we started our days early and the second day was about hiking the Highline Trail. 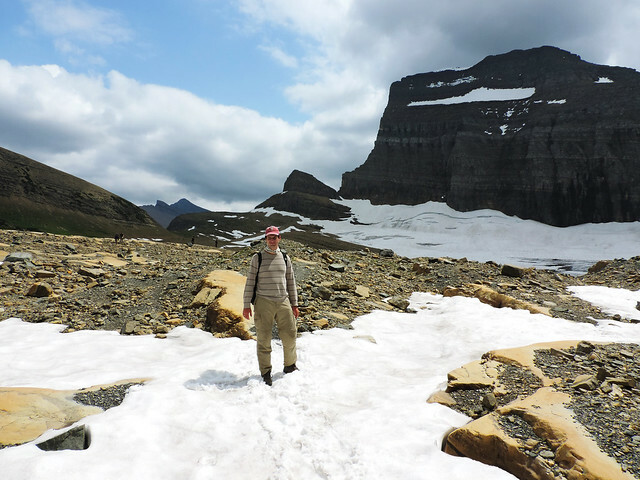 It was our longest and most strenuous hike in Glacier and we enjoyed every moment of it. Okay, we actually made it more strenuous for ourselves than it should have been but no regrets. We didn’t take the shuttle from the end of the trail rather we hiked back to the trailhead with a short but very steep detour to amazing Grinnell Glacier Overlook on the way. Since most people take the shuttle we were almost alone on our way back. 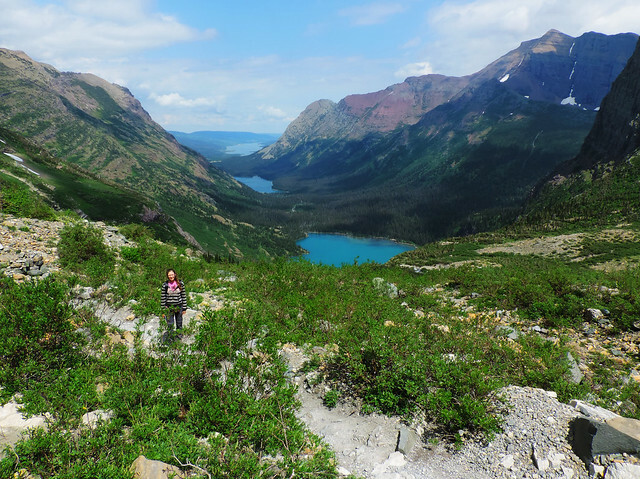 We chose a much easier but equally beautiful trail for the upcoming day: the trail to Cracker Lake, the most special of all the amazing lakes in Glacier. The trail was running along a small creek in a charming valley. And there we stood on the shore of Cracker Lake that looked almost unreal with its perfect aquamarine color far away from cities and crowds. There we stood almost alone. The hike took about 4-5 hours so we got back to the trailhead quite early in the afternoon. So we decided to do the first short section of Swiftcurrrent Pass Trail – just until Redrock Falls. It was an easy and very pretty hike! 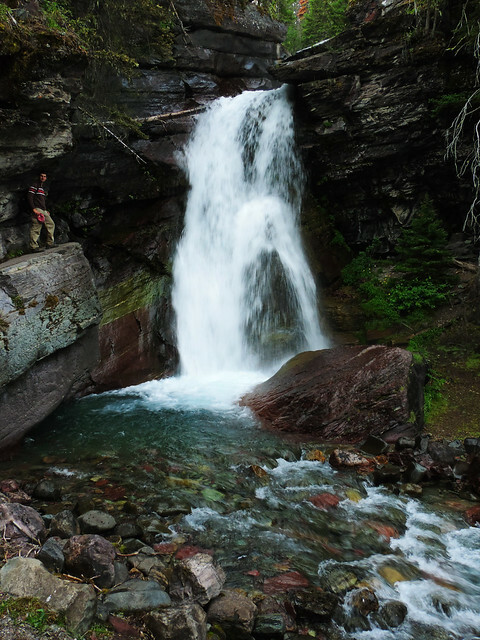 We barely met people on the trail and this short hike had some special surprises for us. Like seeing moose swimming in Redrock Lake. 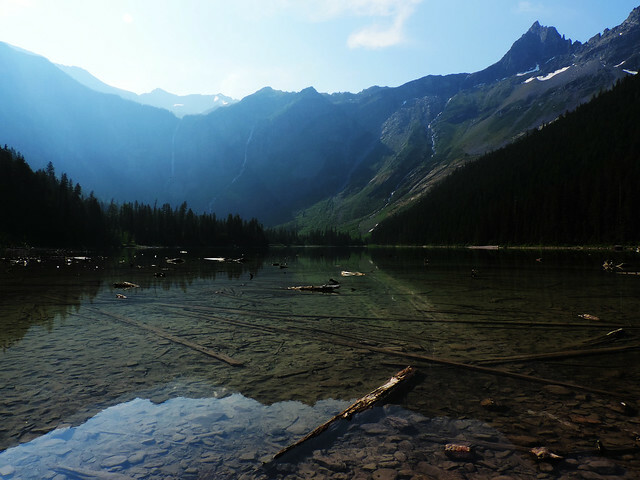 Or experiencing the solitude and beauty of a clear calm evening in Glacier National Park. It was the day of solitude anyway. And we keep these moments deep in our heart. Our fourth and last day. It was mostly about driving through the park from Saint Mary Lake towards Lake McDonald and West Glacier and then saying goodbye. The name of this road is Going-To-The-Sun Road that sounds so positive and heartwarming and oh, it fits perfectly! It’s one of the most wonderful scenic drives in the United States. Should we say anything more? I think you are already flooded with all the superlatives and I know you think we must be very biased. And you are right. 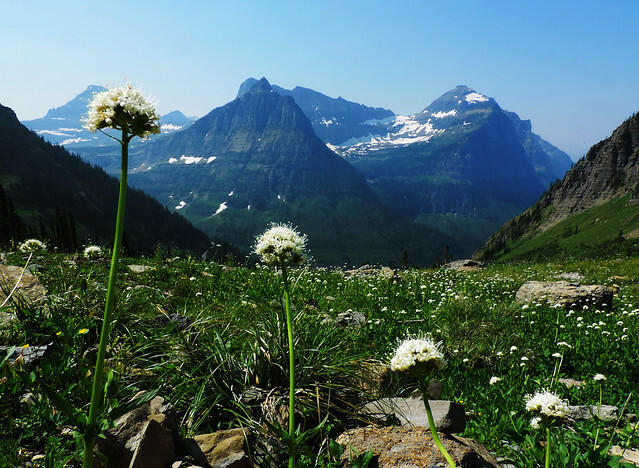 We are so damn biased about Glacier National Park! But it doesn’t bother us at all. After all we spent there 4 days that proved us reality can sometimes be more magical than dreams. And I suspect what you might be thinking now and I agree: it’s time to finish this post and get back to Earth. Your turn then. Which places have you dreamed of visiting? Next post Waterfall Addicts, Get To Know Krka National Park!